Sine wave filters in CSR. This series adjustable resistors are constructed of 2 wirewound tubes can be powered with about 65% of the corresponding nominal load of the fixed types with corrugated wire for extra high demands on surge or pulse load. They are wirewound enameled or cement coated resistors with an open area along .. This series adjustable resistors are constructed of 3 wirewound tubes can be powered with about 65% of the corresponding nominal load of the fixed types with corrugated wire for extra high demands on surge or pulse load. They are wirewound enameled or cement coated resistors with an open area along .. The SX7D-2 series adjustable resistors are constructed of 2 wirewound tubes can be powered with about 65% of the corresponding nominal load of the fixed types with corrugated wire for extra high demands on surge or pulse load. They are wirewound enameled or cement coated resistors with an open area .. The SX7D series adjustable resistors can be powered with about 65% of the corresponding nominal load of the fixed types with corrugated wire for extra high demands on surge or pulse load. They are wirewound enameled or cement coated resistors with an open area along the resistors where the resistor .. This series adjustable resistors are constructed of 8 wirewound tubes can be powered with about 65% of the corresponding nominal load of the fixed types with corrugated wire for extra high demands on surge or pulse load. 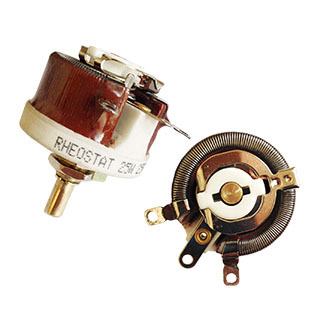 They are wirewound enameled or cement coated resistors with an open area along ..
Rotary Rheostats, like potentiometers, are generally used in applications that demand variable control for higher amounts of voltage. As a result of the reduction of size and power consumption in many of today's electrical devices, rheostats, are not as frequently found in commercial and industrial .. Copyright © 2018, Shenzhen Sikes Electric Co., Ltd, All Rights Reserved.